Waste King is the pioneer of garbage disposers, producing high-quality products for over a decade, making it a reputable name amongst plumbers and consumers alike. Their Legend series garbage disposals featuring continuous feed operation is an excellent addition to their line of appliances. 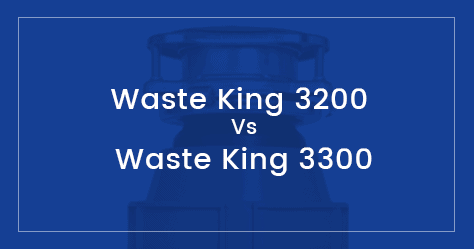 Two of the most prominent disposers that are part of this family are Waste King Monarch L 3200 and Waste King Samurai L 3300. Both of them have been favorite among users, but when it comes to selecting a particular model which one wins the battle? Let’s have a closer look at the units to understand which one steals the show. The L-3200 and L-3300 garbage disposals are like brothers, or better, like twins. Both are manufactured by the same company Waste King, both follow the same design pattern, both use EZ Mount system for mounting, uses Jams Less technology, comes with power cords, both are continuous feed, both are powered by the same 3/4HP motor running at a speed of 2700 RPM, and I could go on, but enough on the similarities here. Oh! and the price, they too are VERY similar. Like twins, these models have certain differences which undoubtedly will weigh on your buying decision. So here they are, as a table for easy comparison. The disposer comes along with a warranty for a period of 8 years on in-home services, while the chamber has a lifetime warranty against corrosion. The Waste King L-3300 has 10 years warranty with in-home services along with a lifetime corrosion warranty on the grinding chamber. Conclusion: Which should you buy; L-3200 or L-3300? As mentioned above both garbage disposals are like brothers; L-3300 being the slightly better one. If I were to choose between them I would go with the L-3300 model because the price difference between them is negligible and it has the added benefit of a longer warranty, bigger size and better sound insulation.